TWO HARBORS — Over the years, members of Channel Cruising Club have participated in an annual fundraising event helping out Santa Catalina Island’s Little Red Schoolhouse at Two Harbors. This year, they are donating their time, too. The club has been involved with Two Harbors’ Little Red Schoolhouse since its inception. The club’s founder, Cliff Tucker, originally constructed the one-room schoolhouse in 1952. After Channel Cruising Club officially became a club in 1958, Tucker organized a fundraising effort to benefit the school, allowing club members to give back to the island community that they frequented on cruises to their camp they called “The Hill” — just east of the Isthmus. With a population of around 150, Two Harbors’ schoolhouse has always been in a state of flux, with classes teaching as many as two-dozen children at one point and as few as three students in 2005. As the only one-room schoolhouse in Los Angeles County, operating in the Long Beach Unified School District, funding issues have come and gone over the years — but the schoolhouse has always survived. 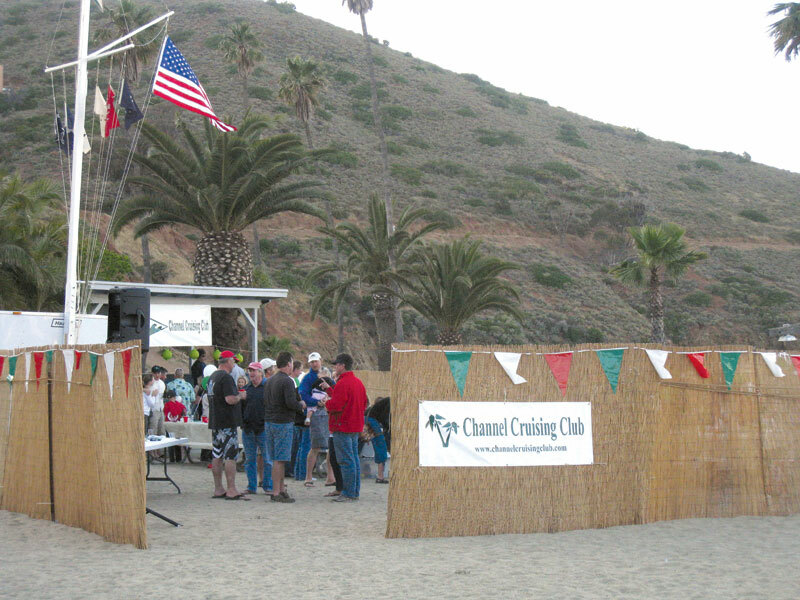 Recently, Channel Cruising Club has come upon some hard times itself: The club’s lease with the Santa Catalina Island Co. ran out in 2010, leaving members to face a rent increase for their 1.5-acre waterfront camp that took the rent from $18,000 to $60,000 a year. The club decided the new fee is too high for members to cover with their current cruising program, so they let the lease run out on the property. While the club lost their “home,” they did not lose their love of the island — and members have restructured their events to operate out of a trailer kept at Two Harbors that can be brought down to the beachfront bandstand for events. “We have everything in that trailer that you need to throw a three-day get-together, including coolers, chairs, barbecues — everything,” Harmon said. With the club now renting the bandstand area from Two Harbors Enterprises for its functions, Harmon said the club’s tradition of sending male members over for a working “stag” weekend at the beginning of May to set up the camp was no longer needed, and that gave the club’s members the chance to lend a hand to the schoolhouse. “This year, we got the go-ahead to do the landscaping around the building. So, we’re going to plant flowers and trim the bushes and trees,” Harmon said. With the club’s ever-growing family element, Harmon decided to open up the event to all club members, stressing his desire to get the Channel Cruising Club kids involved with the project. So far, around 20 to 30 club members have signed up for the project. “We’re hoping this is the start of something much bigger, and we want to get other clubs involved,” Harmon said. The club is planning to cruise to Two Harbors May 4 and begin landscaping the school area the morning of May 5. Boaters interested in participating in the Little Red Schoolhouse landscaping project can call (714) 280-0333 or email joeyharmon@aol.com.